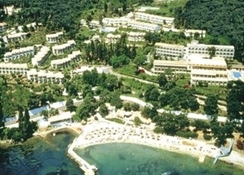 The Aeolos Beach Resort is ideally situated on the south eastern coast of Corfu within 8 km of the Corfu's city centre and 7 km from the international airport. It is a perfect combination of town and resort that allows all its visitors to enjoy a peaceful and leisurely holiday. The well known Aeolos Beach Resort is a wonderful choice for a holiday destination as it offers a fantastic array of facilities and services to ensure guests' utmost comfort, convenience and satisfaction. It is also truly unique as it has its own private beach about 50 meters away that can be reached via an underground tunnel. The hotel is a place that will definitely turn a vacation into a fantasy, leave a lasting impression and unforgettable memories. Please note that Baby Sitting is upon request and with an extra charge. Towels are also provided for the beach with a deposit. Hotel is not suitable for people with walking difficulties.